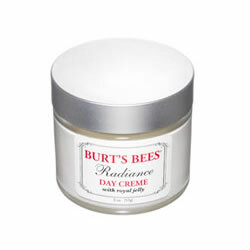 Burt's Bees Radiance Day Cream has a deliciously quick absorbing formula that light to the touch, but heavy in nutrients. Burt's Bees Radiance Day Cream utilises the natural power of Royal Jelly, one of nature's most nourishing substances, packed with 134 nutrients, including 17 amino acids, and vitamins A, C, D and K, as well as multiple B-vitamins. This complex of ingredients helps to minimise the appearance of fine lines and renew your skin, whilst bee pollen helps skin maintain its essential moisture and restore its natural radiance.